Living in the city affords a boodle of burger varieties, accommodating all the price ranges, incorporating an endless array of ingredients and specializing in unique sides to quell my cravings any time of day. I can eat the lower ranking, mass produced patties of fast food chains or work my way up to gourmet grinds (sirloin, short rib and other cuts) of meat, a swanky mise-en scène of Hollywood’s hippest hamburger, depending on how much I am willing to spend. In Los Angeles the gourmet burger phenomena has clenched its fist around our city (big cities in general) and there are a few places that stand out in the LA area, including but certainly not limited to: 25˚, 8 oz. Burger Bar, Umami Burger and Father’s Office. It would be difficult to maintain a burger and wine blog without tipping the fedora to these masters of the patty. 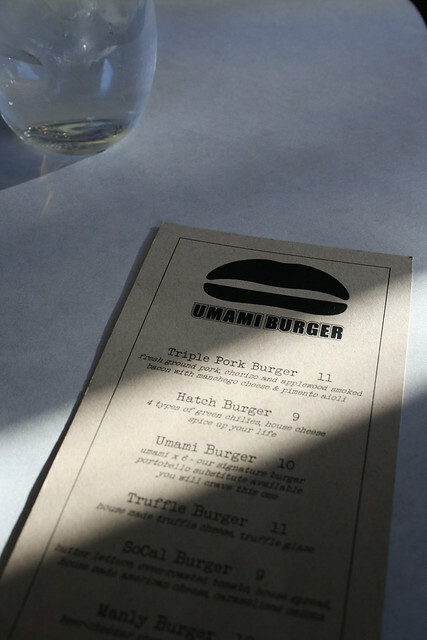 Not too long ago, in GQ Magazine, Alan Richman decided to be a maverick and sniff out the best burger in America, platitudes not to be doled out carelessly, even more, he decided that Umami burger would take those honors. After that article was released, Yahoo decided to repost it, slapping the article and an even more obnoxious title on the piece to their scrolling marquee of eye-catching news items. I was inundated with questions and comments about my opinion of the piece and the place, as if I know everything about hamburgers, or subscribe to a burger blog called A Hamburger Today, riding shotgun with Damon Gambuto through the city of Angels… no, no, not me. I know that the article was well written and that a lot of other critics are in agreement about the best place to find a hamburger in LA, maybe California, but the country pushes that theory to the brink. It is an arduous task to assign rank to so many different variations (burger joint vs. gourmet burger) but feel that if you do, it is incredibly subjective, and therefore I rarely rate burger establishments (and any inclination is behind me now) because I know they are created in unequivocally dissimilar styles! Alan Richman made a bold claim about a local restaurant, one that I had the means of traveling to. 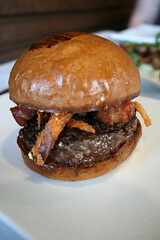 It was time for me to recast my attention on the dressed up and sophisticated burgers of Umami. After spending four plus hours at the LACMA, my eyes were full, ingesting an entire course of artwork from Koons to Kadinsky, but my stomach on the other hand was howling for nourishment. 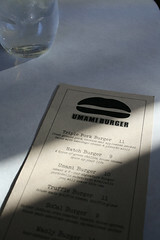 I decided the best course of action would be to dine nearby and document my third trip to Umami Burger (I am beginning to adopt the LA Times food critic strategy before reviewing). 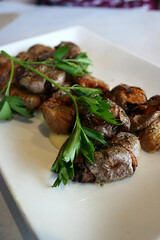 I made it to La Brea in no time, pulled up to the valet and in minutes was seated inside Umami. The service in the past was a little spotty, borderline rude and that has always been my knock against Umami, not the burgers but the people, it makes for uncomfortable dining when you are in combat with your server. Anyway, with the luck of the draw I had a nice but inattentive server, busy with a ton of other things than his station and the wait was much longer than I remembered, roughly twenty five minutes elapsed before my burger (The Manly Burger) and smushed potatoes made the table, but it seemed a legitimate wait; there were some rather bulky orders for parties piling up in the kitchen, my order happened to be lost in the shuffle. The presentation is minimal, understated and clean. Arriving on a long ceramic plate straight outta Surfas the softball of a burger sits proudly. The burger bun is always eye-catching, a little too big, like button cap mushroom that dwarfs the rest of a substantial setup by comparison. The patty is generous, cooked medium and finely seasoned. 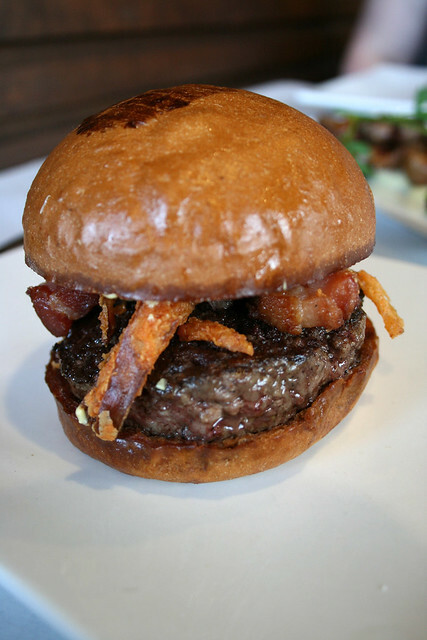 The addition of bacon lardons, thick ends of smoky-salty-fatty chunks of pork, adds depth to the fairly straightforward beefiness of the burger. The onion strings bludgeon the taste buds with a similar smoky profile. There is also an aioli replete with horseradish, not listed in the ingredients that add sharpness to each bite, keeping the salinity in check. The burger is calculated and though it spares greens—in display or on the burger—all else is covered. If you grow up in a Dutch household, the potato is the only vegetable you are comfortably attuned with, at least in my household, so the smushed option seemed fitting. A double fried Dutch yellow creamer with a measured sprinkle of coarse salt sitting atop a rich creamy fry sauce (in the same ilk as the friet met—the mayo-driven accompaniment to the frietjes of the Netherlands or Belgium), complimented the meal and were a welcome reprieve to French fries, though the sides still did not top my favorite at the Golden State. On a whole, much like the other times I went to Umami, I left satisfied by the burger, not feeling like I had transcended time, or had a mind-altering experience with fleeting bits of ecstasy but rather a very carefully crafted burger. I admire Alan Richman—that heavily decorated food writer for GQ—for the gumption to extol Umami openly; I am not so outward in my adoration, believing more can always be done and to never become too comfortable (Thanks Dad!). I do feel that aside from the burger being marred by inconsistent service (a definite factor in any restaurant receiving nearly perfect accolades) it offers a bounty of goodness. Enough so that you too, should try it for yourself. Douzo meshiagare.